Constellation Canis Major the Greater Dog, sits south of constellation Gemini, between constellation Orion and constellation Argo Navis. 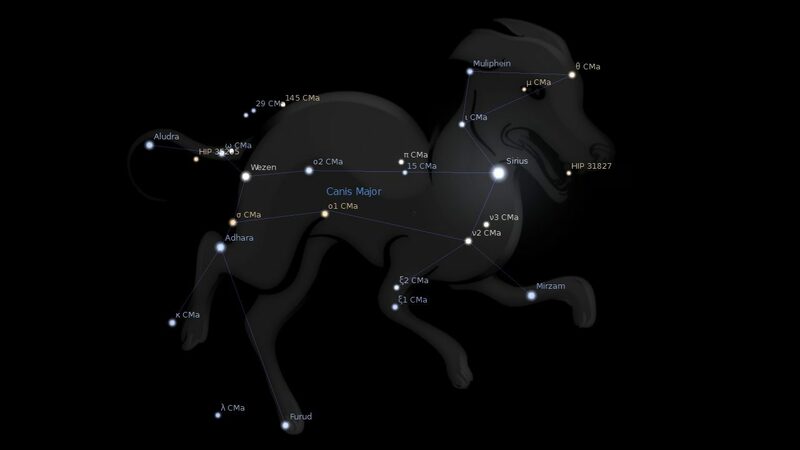 Canis Major spans over 20 degrees of the Zodiac in the Sign of Cancer, and contains 11 named fixed stars. including the brightest star in the night sky, Sirius the Dog Star. 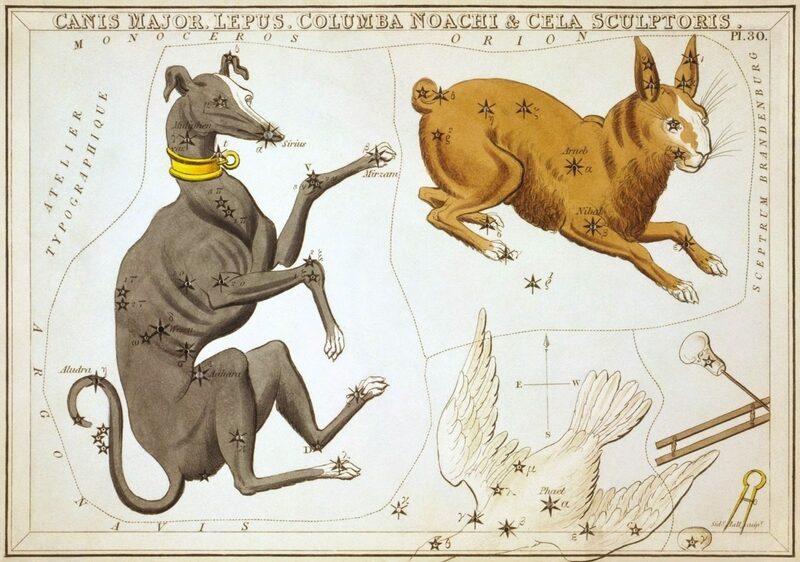 This constellation is said to represent the dog set by Jupiter to guard Europa whom he had stolen and conveyed to Crete. According to other accounts, however, it was either Laelaps, the hound of Actaeon; that of Diana’s nymph Procris; that given by Aurora to Cephalus; or finally one of the dogs of Orion. This second constellation carries on the teaching, and tells of the glorious Prince who will thus subdue and reign. In the Denderah Zodiac he is called Apes, which means the head. He is pictured as a hawk (Naz, caused to come forth, coming swiftly down). The hawk is the natural enemy of the serpent, and there it has on its head a pestle and mortar, indicating the fact that he shall crush the head of the enemy. In the Persian planisphere it is pictured as a wolf, and is called Zeeb, which in Hebrew has the same meaning. Plutarch translates it Leader. In Arabic it means coming quickly. The next star, β (in the left fore foot), speaks the same truth. It is named Mirzam, and means the prince or ruler. The star δ (in the body) is called Wesen, the bright, the shining. The star ε (in the right hind leg) is called Adhara, the glorious. 1. Fixed Stars and Constellations in Astrology, Vivian E. Robson, 1923, p.34. 2. Star Names: Their Lore and Meaning, Richard H. Allen, 1889, p.117-118. 3. Astronomica, Manilius, 1st century AD, book 1, p.34-37. 4. The Witness of the Stars, E. W. Bullinger, 34. Canis Major (the Dog).